enkel probleem! By the way: Wanneer je googled op Tasty bonsai; vindt je een groothandel die prima materiaal verkoopt (pre-bonsai) om verder tot ondermeer tropische bonsai te vormen. Wine grape bonsais are similar to bonsai trees, except that they grow in a vine form. However, since grape vines have a very thick central vine, the wine grape bonsai resembles a small tree with a thick, woody trunk. Although some aspects of traditional bonsai care also apply to the wine grape bonsai, many others such as fertilizing are very different. Wine grape bonsais are grown mainly for ornamental purposes although the fruit is edible. 1 Water the soil until it drains out of the lower portion of the pot. Water the soil daily or as often as needed to prevent it from drying out. Grape bonsai varieties require more water than traditional bonsai trees, especially when fruiting. 2 Set the pot on a saucer filled with a single layer of pebbles to catch the water runoff from the pot. This also prevents water from pooling near the bonsai roots which will kill it. 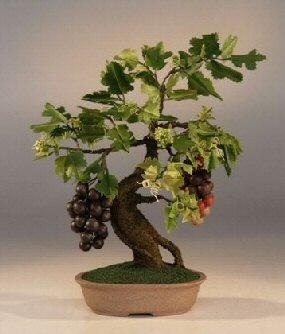 3 Place the wine grape bonsai pot in a brightly lit room 2 feet away from a window. During the spring, summer and early fall you can also place it outdoors in an area that provides sun in the morning and shade in the afternoon. 4 Fill an empty milk jug or other plastic container with a water-soluble plant fertilizer, such as 10-10-10 and add twice the amount of water recommended on the package. Apply 1 cup of the mixture once per month from the early spring through the fall. Stop fertilizing in the winter. 5 Wait until winter, when the wine grape bonsai is dormant and prune the tip of each vine back with hand pruners. Locate the point where each vine branches off from the main trunk and count out two leaves or buds and cut the vine off just above this location.